You’ve worked hard to get to where you are—law school, clerkship, traineeship—putting in long hours, sacrificing time with family and friends along the way. After all that hard work and perseverance, is it time to take your career to the next level? Keen to step up to senior associate or even partner, and need a hand building your own practice? Or, perhaps you’re just not 100% happy in your current role. Maybe you’re searching for that seemingly elusive work-life balance? Wherever your career is at, Sigma Executive will be there. We’ll empower you to make informed decisions about your career, by discerning your goals, your priorities and your dreams. Because we care—truly, we do. 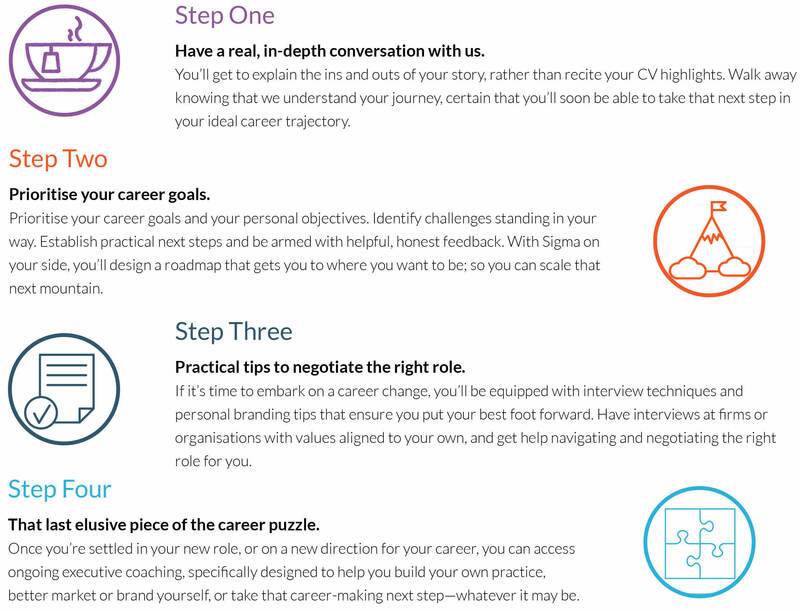 You can pinpoint exactly what you want your career to look like. Take a step back and work out what it is that you really want from your career. You won’t just talk to us about where you’ve been, but about where it is you want to go. You can then lock down a role that delivers the all-elusive work-life balance, challenges your comfort zone, plays to your strengths. A role in which you’ll flourish. You can have the career you’ve always wanted. You’ll set your career goals and your personal objectives. You’ll identify challenges standing in your way. Establish practical next steps, build a practice, make partner, or go in-house—whatever your goals may be. You’ll finally grasp, and hold on to, the career you’ve always dreamt of. Truly.